Ullapool is a large fishing community situated on the North West coast in Ross-shire. It’s large enough to provide shops, hotels, pubs, restaurants etc. It’s small enough to walk on foot but for the folks you might want to consider accommodation near-ish the harbour as most of the facilities centre around that area. The main appeal of Ullapool is its pr acticality and its pretty aspect by Loch Broom. There are many interesting places to drive to from the village whilst using it as a base but there are a couple of things around you may want to look up. Generally speaking, Ullapool is a nice place to while some relaxing time away. The harbour is a fascination and from there y one can also take various trips to view seals and bird life etc. It’s also a main dock for Caledonian McBrayne Ferries there being a crossing over to the Isle of Lewis, Part of the Hebridean Islands. Its a few hours on the boat, and not cheap, however. I wouldn’t recommend it for your trip on this occasion. I can thoroughly recommend the Ceilidh Place Hotel a block behind the harbour as a nice visit on and evening for food drinks or coffee. The Morefield Hotel at first glance doesn’t look terribly promising. It’s reached by driving through a small residential area a few minutes drive north out of the main village. If you enjoy fresh seafood however this is the place for you! Dining is basically in standard hotel bar or in the superior restaurant. The fact that both are crowded with customers most evenings speaks for itself. Facing the harbour with beautiful views is The Ferry Inn. You’ll find impromptu music nights in here with Scottish folk musicians bringing their instruments along for a sing-song. To be recommended. Gairloch is a nice day visit from Ullapool, perhaps with another stop or two along the way. The road between the two villages along the coast has been rated as one of the top six drives in the world. By anybodies standards it is a truly beautiful journey. Look out for views of the magnificent An teallach. Of note is the arresting sight of Gruinard Bay, a long horseshoe-shaped sandy bay looking over to Gruinard Island. The latter became infamous during the last war as a biological warfare testing base by military scientists resulting in its nickname ‘Anthrax Island’. It’s uninhabited for obvious reasons so you won’t be popping over there for a visit. 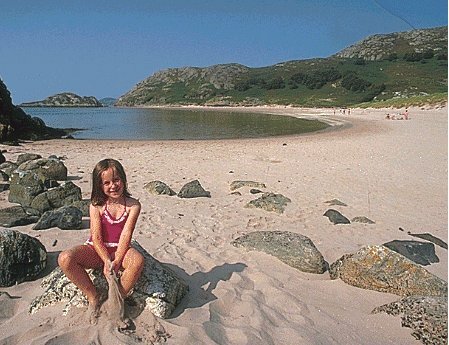 Do stay for refreshments and splendid sea air at beautiful Gruinard Bay however – most worthwhile. 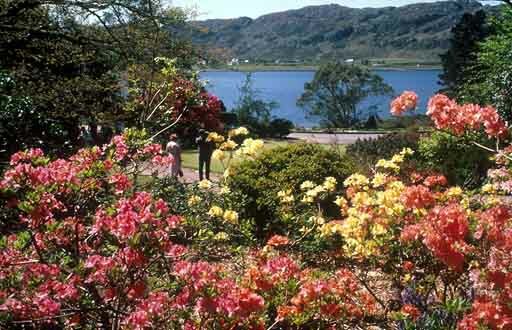 Another pleasant visit in the district of Gairloch is Inverewe Gardens near Poolewe. The large grounds were the brainchild of Osgood McKenzie who made full use of the Gulf Stream’s protective climate. Gairloch itself has a pretty harbour and some nice shops and places to eat. Round to the south of the Loch sits Badachro with its ancient inn overlooking the sailing boats in the harbour. Further along at the road ends lies glorious Redpoint. On my last visit, there stood a single hotel and a few homes. The real beauty is in the fabulous beach of white sand. 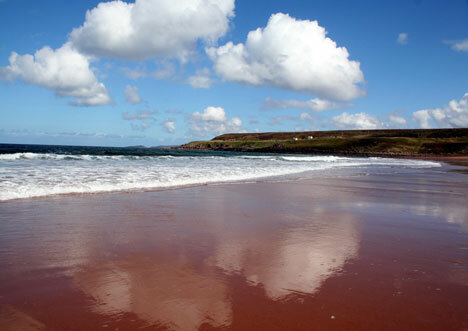 Redpoint is yet another point of past emigration and has its own tales to tell. Now though all that remains is Redpoint’s emptiness and vast natural beach which can resemble a lunar landscape. 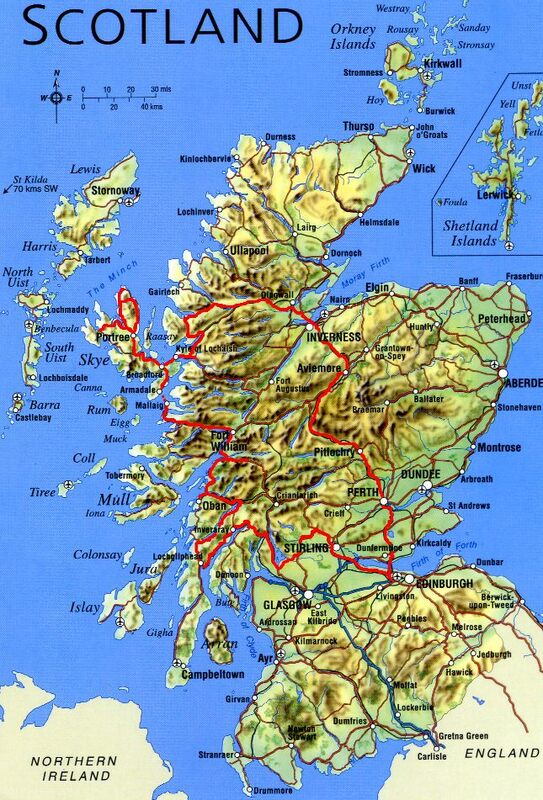 On the 14th August 1773 James Boswell and Samuel L Johnson embarked upon an 83 day tour of the Highlands recording their observations towards their destination of Skye. Whilst not attempting to emulate their tremendous but somewhat formalised view of their journey, mine has been a great pleasure over the years in touring the Highlands of the country I love and I’d like to relate some of my own observations of the area. It wasn’t a single tour as such, but rather a culmination of many, collated as a suggested holiday for a good friend interested in seeing a selection of the glorious landscape. For ease’s sake I have split the tour into separate sections as all of the places I talk about are, for me, very precious and special ones.